What are we needing to see within the dynamics being reflected? Where does balance need to be restored? “Our sense of self-identity (Aries) can only be fully known when we relate to someone else (Libra). With the Moon in Libra, we need to remember to have our own Aries standpoint when we relate to others… True balance comes when each person stands on their own side of the scale. “Our Libra sensibility is how we create good relationships. Both partners’ needs can be met if we learn how to compromise. And compromise means knowing where you stand. “That’s the awareness we can get from this eclipsed Full Moon. Lunar eclipses give us the awareness to bring a situation to an end. 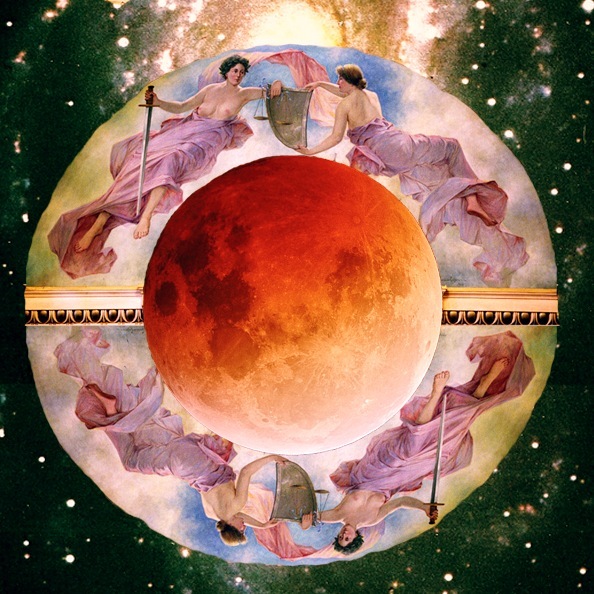 “This lunar eclipse occurs within the womb of the Cardinal Grand Cross that is perfecting this week… As these Powers turn the cosmic wheel, new energies will be available for us to use in our lives and for our world. “Relationships are a key theme during the Full Moon / Lunar Eclipse in Libra at 25 degrees on April 15th, 2014. The energies may feel rocky and unstable as there is density, fear, frustration and other stuck energies coming up to be cleared away. “Lunar Eclipse happens during a Full Moon phase and it symbolizes ‘powerful endings, closure, clearing out, completion .’ It heralds a time of major transitions. It represents letting go, clearing out, purging and releasing especially on an emotional and psychological level. “These changes are not anything new for you know at some level, they have been festering or brewing inside for a long time and it is now coming to the surface. “It is best to feel it through no matter how raw the emotions are. Let go, clear away. The insights come in the aftermath on their own so no need to analyze first as it inhibits the real shift from taking place. Lunar Eclipses are not to be feared, remove the superstition around it. “During the Full Moon phase in astrology, emotions tend to be like high tide in the Ocean. Surge of emotional intensity is now possible. There may be a lot more flowing out through tears, sorrow, pain and even joy. “The emotional level is highly activated now. You will bear witness how you handled things in the past and what you would like to do now. “There may be a key emotional habit, tendency that comes to light now that occurs in relationship (to self, others, life, Divine etc). This habit no longer will serve your highest good and path. It is time to transform it. “…There is a deep purging and cleansing occurring now. Individuals may be feeling a bit raw, very emotional and even on the verge of grieving something very old or from the distant past such as a relationship to someone or something. What is off-balance will really feel off-balance. “With the other astrological transits happening now, there may be an unexpected or out of the blue interaction with another person or people who may shock and upsets the status quo. Sudden breakthroughs are possible and the best way is not to get ensnared into the reaction or anger. It is possible people may act out, lash out and be more abrasive than normal. “If anger has been squelched and stuffed, it may erupt with the slightest friction-based encounter with another or situation. Remember, they are the triggers not the cause. “You are responsible for how you choose to interpret things. As more distance occurs from the situation, you may get more realizations of what really was the underlying cause and how to transform the energy. “…With this Moon we look closely at issues of identity/partnership – Aries/Libra. Who am I? In my body, my projected image, in my inner Self, in my life quest? “…It’s where our cutting edge lessons lay for the next 18 months as North Node journeys through Libra to maximize our ability to see others as our selves and bring harmonious relationship into all we create. Look to your relationships and the needs and longings you have to be personally fulfilled as your teachers. “Tapping into our spiritual connections will help us avoid and balance the chaos and fear that can come from those around us when they lack an anchoring relationship to truth, love and power. “When we experience an eclipse, it is an opportunity for reset. A portal of alignment is created where new influence can take precedence over the old. “The weeks surrounding an eclipse pair contains intensified energy even without an added Grand Cross and will bring to the surface issues that have been long in the shadows especially in those areas where the eclipse falls in your personal chart. “This energy and pressure has been palpable since the New Moon. It will blow through any veins of weakness encouraging the ego to wallow in victimhood, arrogance, depression, stubbornness, fear, helplessness, etc., and it can take you to incredible heights of higher-centered joy, gratitude, creativity, inspiration and connectedness. “….If you are feeling personally overwhelmed at some level by this up-welling of pressure and energy characterized by the Grand Cross/Eclipse event use this advice from river rafting: If you find yourself in a raging, whitewater river whirlpool eddy (of reactivity), don’t try to fight it, there’s nothing to grab onto, it’s not real, it’s not what it seems. “Trust and Surrender are called for; let yourself be pulled downward (into the awareness of your biggest fear). You will hit the bottom (of this illusion) and you’ll catch some downstream current and it will pull you out of your hole and release you into the river (of life). “When planets are stationary their energies dominate- so with Pluto stationary right before the eclipse the images of the snake shedding it’s skin or the phoenix rising out of the ashes is strong. “We are in a powerful time where we are asked to look at what is no longer working in our lives– where is the old skin stuck and inhibiting our further growth. “Where are we surrounded by things/people/situations/ attitudes that are actually toxic and need to be burned in the fire, so we can rebirth ourselves like the phoenix does? The month of April is very much supportive of doing this work! “…Aries is the sign of the self and Libra is the sign of the other. We have a lot of astrology focusing on this polarity and duality right now- forcing us to address where we are imbalanced in our lives. “If we overdo our Aries we are fiery, feisty, aggressive, conflictual and selfish. If we overdo our Libra we are pacifist, have boundary issues, are codependent and cannot stand up for or take care of ourselves. “This lunation is also conjunct the evolutionary North Node- pulling us towards our growth and evolution. Eclipses are already about our evolution and growth, but when we have the nodes involved that focus is amplified. With the Moon on the North Node and the Sun on the South Node- we have an opportunity to look at our karmic past and patterns we keep playing out, as well as our evolution and growth and the edge we need to push past. “…Wherever this lunation falls in your chart, you have significant opportunities to die to some old aspect of yourself and your life and rebirth something new in it’s place. But this is also the area of your chart where you may be avoiding doing the work- so the total lunar eclipse may have to drag it up into your awareness so that you can deal with it. Similar to pluto transits- lunar eclipse energies are best worked with consciously. “If you are proactive about your transformation and take initiative in facilitating and making the changes in your life you need to make- then the Universe tends to reward you and support you. That is how you take a breakdown and turn it into a breakthrough- the key word is to “break” from the past patterns and ways of doing/being that no longer serve. Lunar Eclipse Blessings to all! >>>✧✧✧✴ IF YOU WISH TO SHARE please use the links below or quote a small passage and link back. Please do not copy entire report for your blog, website or FB page. This report (and all else on the site) was lovingly curated as content for MYSTIC MAMMA. Hello, do you have any idea on how to find where this lunar eclipse falls on my natal chart? Thank you! If you already have your natal chart, look to see where 25 degrees of Aries and Libra fall. If you have planets at 25 degrees of any sign, they will be highlighted as well. If you do not have your birthchart, you can get it calculated for free at alabe.com. Good luck Maria. I’m Scorpio, Aries rising, Moon in Libra, Venus in Libra…in an unhappy relationship. Need to get out. Be free. Beautiful! Thank you for the inspirations! Happy Lunar Eclipse! Thank you Mystic Mamma! Any rituals, prayers, or meditations to help us make these breaks? This has very literally manifested itself in my life and I’m ready to let it go! Thank you! I have my moon 3 degrees in Libra and am a Taurus and Taurus rising. I always feel the moon’s energy and no doubt am looking forward to tonights eclipse. The relationship that needs to change is the one relating to myself and others. I am in a very a happy and harmonious marriage (thankfully). I tend to be hard on myself, especially now as a mother and am learning to let go of my stubborn nature and rigid black and white view of the world. Harmony is the key word for me. Happy Moon Blessings everyone! Find where 25° Arie4s and Libra are and check those houses. The effects will be seen there. This the time to see ourselves, to shapes a more healing and accepting planet for self and others. As we release old patterns and behavior we indeed are prepared to embrace new awareness and accepting of our personal being and responsibility to be co creator for a different reality on the planet. You see we are the makers and dreamers of our own reality for example, if I am having a bad day, I look for lens that I used to create the bad day. I am the peace, joy and happiness that I want to see on the planet. I am interested in know how this full lunar eclipse affects my chart or how I can get some insight and if there is a place I can go for free helpful information to read about it. Anyone know where I can go to see how this eclipse relates to my chart information? If you are proactive about your transformation and take initiative in facilitating and making the changes in your life you need to make- then the Universe tends to reward you and support you. That is how you take a breakdown and turn it into a breakthrough- the key word is to “break” from the past patterns and ways of doing/being that no longer serve. I am crying reading this. I first thought I was going crazy. Since the new moon. I cannot believe how accurate every word of this has turned out to be. I first read it day after the eclipse and now that I refer back to it, it all makes even more sense. I see how it all plays out not just with me but with many people I know. Thank you for helping me navigate these turbulent but rewarding waters. I am in a relationship that is draining me both physically and mentally,and am desperate to get away. I need to be free can this Lunar eclipse help shed any light on me getting what I need to escape.